To love God, make disciples, and love our neighbors according to the Great Commission (Matthew 28:19-20) and the Great Commandment (Matthew 22:35-40). To be a church in and for urban west Charlotte devoted to biblical teaching, fellowship, the breaking of bread, and the prayers (Acts 2:42). Our desire is to be a simple church that focuses on the teaching of the Bible (“the Apostle’s teaching”), the sacraments that Jesus gave the church (“the breaking of bread”), and the worship of God (“the prayers”), all experienced in the context of a church family that loves and cares for one another (“the fellowship”). In addition to this very simple Mission and Vision, the three values of West Charlotte Church include “parish” ministry, “ordinary means of grace” ministry, and “multiplication” ministry. 1. 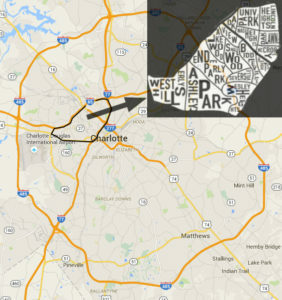 “Parish” Ministry: We are a church committed to being in and for urban west Charlotte. This is our “parish.” We celebrate the beautiful diversity of the people of urban west Charlotte, as well as the unity found through a shared faith in Jesus Christ (Ephesians 2:19-22). 2. “Ordinary Means of Grace” Ministry: We are committed to experiencing God’s grace through simple ministry. These simple means include the the Bible as the Word of God, the sacraments as signs and seals of the promises of God, and prayer as the expression of our communion with God (Acts 2:42). These elements are the ordinary means of grace that God uses to grow us for his glory and our good. 3. “Multiplication” Ministry: We are committed to church growth through both the development of the spiritual gifts of the whole congregation and the development of church leaders (Ephesians 4:11-16).